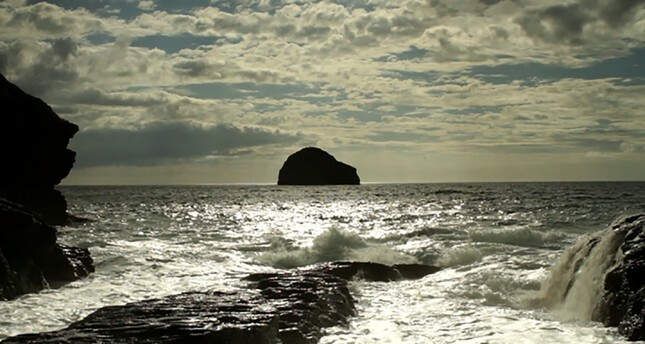 Still from the film "Hydra Decapita," 2010, by the Otolith Group. SALT's "Black Atlantis" program is a selection of sea-related resistance and cultural formation stories including video pieces by The Otolith Group, Sophie Mallett, Halil Altındere and Agnieszka Polska as well as a film by Jean Painleve. Speculating on the present-day and future, the program will begin with an experimental lecture-performance by Ayesha Hameed on April 6. Writer, artist and lecturer at Goldsmiths University in London, Ayesha Hameed explores the themes of contemporary borders, migration and visual cultures of the Black Atlantic, a distinct culture, shaped by slavery and the slave trade all along the Atlantic rim countries. The fifth part of her lecture-performance "Black Atlantis, Retrograde Futurism" (2018) is an audio-visual essay on a six-meter "ghost boat," carrying the desiccated bodies of 11 young men, which were found adrift off the Barbadian coast on April 29, 2006. It set sail on Christmas day from Cape Verde en route to the Canary Islands and was full of migrants from Senegal, Guinea Bissau, and Gambia. Each of these men had paid $1,166 for their place on the boat. Presenting an inadequate telling of the story, Hameed's lecture-performance, hovering between film and the essay form, questions the adequacy of measuring history. Founded in 2002 in London by Anjalika Sagar and Kodwo Eshun, the Otolith Group's "Hydra Decapita" (2010) centers on the work of Detroit-based techno music duo Drexciya. Influenced by Afro-futurist theories, their 1997 album "The Quest" revealed that Drexciya was a submerged underwater country that was populated by the unborn children of pregnant women who were thrown overboard during the middle passage of slave ships across the Atlantic. Focusing on the 1871 Zong Case in "Hydra Decapita," The Otolith Group used this imagined world as a point of departure to explore notions of globalization, capitalism and climate change, with particular attention to the relationships between finance, death, abstraction and language. Artist and filmmaker working in London, Sophie Mallett speculates the future of oceans if jellyfish populations were to continue to grow due to increasing seawater temperatures and overfishing in this 2018 work. Recalling the prehistoric days when jellyfish ruled oceanic life, the docufiction film investigates the resistant and opportunistic inheritors of the seas and the strategies they adopted to become the protagonists of a new era in geopolitics. Specialized in underwater fauna, photographer and filmmaker Jean Painleve (1902-1989) shot 1978 "Acera ou Le bal des sorcieres" [Acera or the Witches' Dance] film along the coast of Brittany in France. Combining scientific research with avant-garde art, the work presents the balletic choreography of acera, small ball-shaped mollusks that are about two inches in diameter. The camera elegantly captures the mollusks' mating dance as they flit to the dramatic melodies of the composer Pierre Jansen. Artist Halil Altındere's "Siren" (2016) opens with a monologue by trans activist Belgin Çelik, as she recounts her days at traveling funfairs in Anatolia where she performed in a mermaid costume. Inspired by her story, the work turns into a tense underwater chase movie with action sequences borrowed from B-movies. Working with computer-generated media, artist Agnieszka Polska's work dated in 2017 posits the figure of a mermaid as a symbol for the Polish identity crisis. With the aquatic creature being the emblem of the capital city of Warsaw, the artist merges myth, history and politics to question the annihilation of Slavic paganism in the 10th century and the Christianization of Poland. Taking place in the Walk-in Cinema at SALT Beyoğlu, Black Atlantis is free of charge.